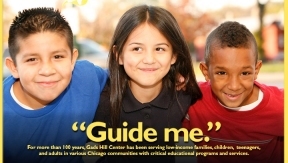 Gads Hill Center will host its annual Benefit Gala on Thursday, April 23rd, celebrating 117 years serving Chicago’s west and southwest sides. This year’s Gala, Transforming Families Through Education, celebrates children and their families – their ability to learn, lead, and positively shape their future. At the event Gads Hill Center will pay tribute to the amazing dedication and support of our partners. Alejandro Menchaca will be honored with the George W. Moss Founder’s Award, and Walsh Construction will be presented with the Outstanding Partner Award. Anthony Ponce from NBC 5 will emcee the evening, with live entertainment provided by Martinez Brothers. The event will be held at Lacuna Artist Lofts, 2150 S. Canalport Avenue, Chicago, IL from 6:00 – 9:00 pm. Tickets are $150 and are available at http://annualspringgala-transformingf.splashthat.com.